Leeann Tweeden, a radio news anchor on KABC,said the former “Saturday Night Live” comedian had written the script for the December 2006 show that included him giving her a kiss. Tweeden said she then walked away. In a statement, Franken said he has a different recollection of the encounter. “I certainly don’t remember the rehearsal for the skit in the same way, but I send my sincerest apologies to Leeann. As to the photo, it was clearly intended to be funny but wasn’t. I shouldn’t have done it,” the statement said. Tweeden said she eventually performed the skit with him, but turned her head at the critical moment so he couldn’t kiss her on the lips. 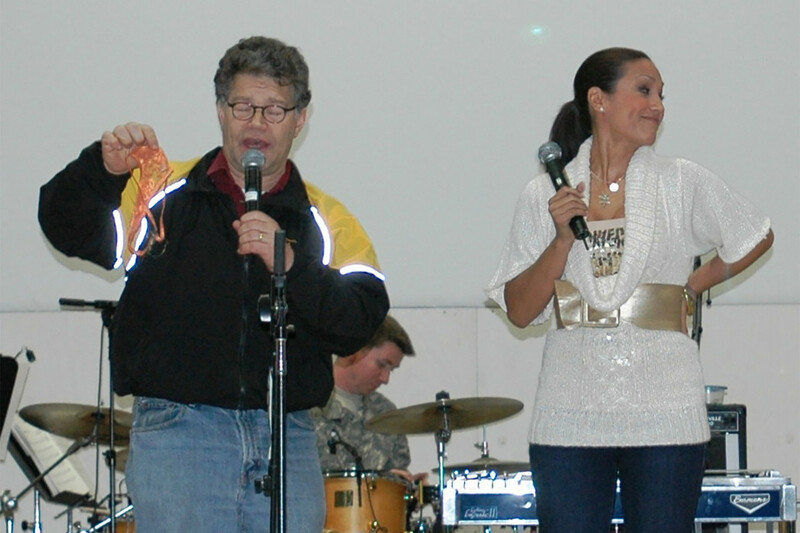 She said nobody saw her and Franken backstage and she decided not to mention it to the USO representative. While angry about the encounter, she decided to move on and tried to avoid the comedian whenever possible. But then she was looking at photos of her trip back to Los Angeles after the tour wrapped. In one picture, Franken was caught with his hands on her chest while she slept while wearing a flak vest and a Kevlar helmet. Although she said she wanted to “shout my story to the world with a megaphone,” she was worried about the backlash and damage that publicly exposing the incident could cause to her broadcasting career. “I am no longer afraid,” she wrote. After reporting about the allegations against Weinstein and California Rep. Jackie Speier’s story of being sexually assaulted when she was a congressional aide, Tweeden realized she had to come forward. She said she is still angry at Franken and her reluctance to blow the whistle on him. “Every time I hear his voice or see his face, I am angry. I am angry that I did his stupid skit for the rest of that tour. I am angry that I didn’t call him out in front of everyone when I had the microphone in my hand every night after that​,” she wrote.